Scott Flynn Properties, are the powerhouse behind the announcement today by Deputy Prime Minister and Minister for Regional Development Hon Warren Truss of a $150 million hotel and conference centre development at Brisbane Airport. The development, which features Brisbane Airport’s first five star hotel, includes a 10-level Accor branded 5-star Pullman Hotel and a 3.5 star Ibis Hotel as well as the Brisbane Airport Conference & Meeting Centre. “Not only is this Brisbane Airport’s first 5-star hotel development, we believe it is the best hotel opportunity on the eastern seaboard of Australia. The $150 million development will complement Brisbane Airport’s offerings, bringing it another step closer to realising its Master Plan," said Anthony Flynn, Managing Director of Flynn Property Group. Mr Flynn said in just five years Pullman had redefined upscale hotels and resorts in international capitals around the world, with the Pullman Brisbane Airport adding to the brand’s significant global footprint. 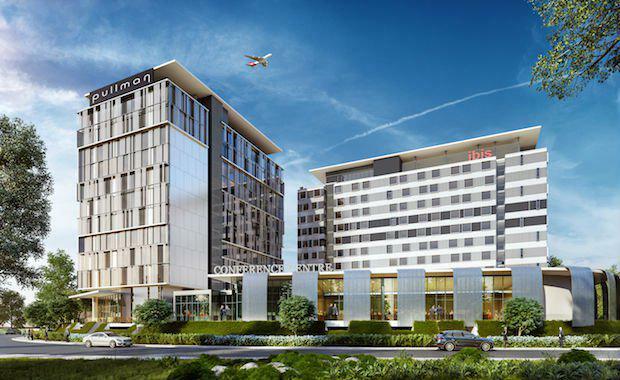 “Ideal for the business traveller the five star Pullman Brisbane Airport will feature 130 rooms including two presidential suites and 10 junior suites, an upscale restaurant and lounge bar, leisure and lap pools, an executive club lounge and business centre. This is a much needed top-end mix as Brisbane realises its own branding of becoming a New World City,” he said. “The Pullman’s sister is the Ibis Brisbane Airport, offering 243 rooms including 99 superior rooms and alfresco dining. This hotel will bring to Brisbane an elevated level of affordable quality and comfort along with a major new social attraction for Brisbane Airport- a stylish rooftop lounge and bar overlooking the main runway and Moreton Bay. "The conference and meeting centre will expand Brisbane's conferencing capability by 600 delegates. The centre will offer 13 conference and meeting rooms including a 300 seat pillar-less ballroom, boardrooms, business centre, cloakroom as well as generous breakout terraces. Flynn Property Group and Scott Flynn Properties have confirmed that renowned Australian architect Noel Robinson is behind the design. Construction will begin in February 2015 with completion due end-2016.